As Art X Brand collaborations are our dada, we thought it would be interesting to take a closer look at what’s been happening in the world of tableware. In 2013 Bernardaud, the luxury porcelain manufacturer, decided to celebrate its 150th anniversary by creating a range of dinnerware in collaboration with well-known artists, architects and film directors. The result was a series of 6 to 12 piece dinner services that invite the diner into the creative world of each guest designer. Sophie Calle’s subtle set, ‘Le Porc’, is a reflexion of the auto-biographical enquiry that inhabits her work. A line of text runs delicately through the centre of the 12 plates, telling the story of an encounter she had with a fellow artist when she was 30 years old. 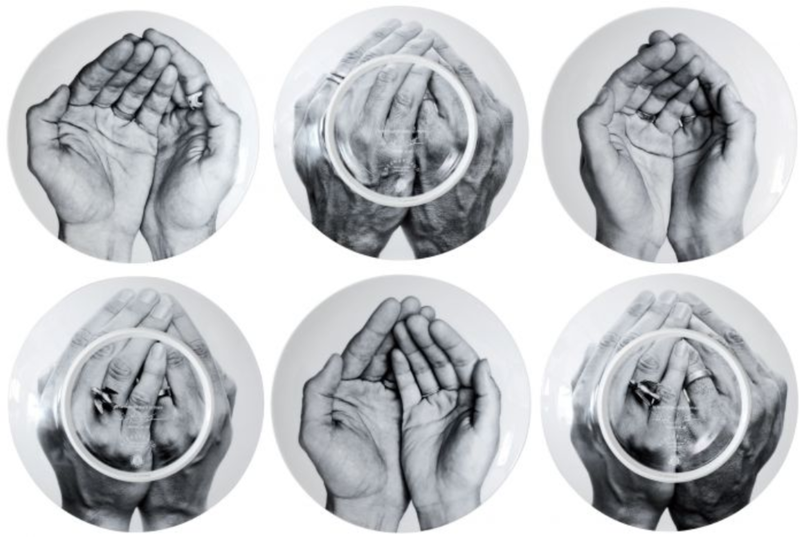 ‘What I really like about these plates is creating a situation where people would have to engage with one another and look at the text written in each others’ plate - sort of breaking the usual table sitting arrangements and rituals,’ explains Calle. Some of the sets, such as Jeff Koon’s Banality series, replete with Michael Jackson and Bubbles, seem more suited to hanging on the wall rather than under your Sunday roast. But of course this is the pleasure, you can choose the functionality of the plate or simply enjoy it as a work of art. Whatever you decide to do with them, these dinner services make your average dinner plates look distinctly dull. Yet the notion of tableware becoming legitimate works of art in their own right is not new. Back in the late 80’s a group of collectors got together to form Artes Magnus, a company that invited artists to design an item of tableware, that would be functional, but produced in limited edition. They got some big names on board, including Cindy Sherman, Roy Lichtenstein, John Chamberlain and Kiki Smith. The artists responded in a range of different ways. Lichtenstein produced a ‘landscape’ centrepiece in his unique style, while Kiki Smith designed a silver bowl and Cindy Sherman created a Madame de Pompadour inspired tea-set and tureen with herself disguised as the eponymous aristocratic. The limit editions range from 25 to 250 and have since become collectibles in their own right. A tureen from the Pompadour series recently sold for $10’000 at auction, while a ‘Landscape mobile’ (Limoges) by Lichtenstein sold for $60’000 at Sotheby’s in April this year. The collection has also been acquired by prestigious museums and can be found in over 30 international institutions, including the Guggenheim, the Museum of Modern Art New York, MOCA Los Angeles and the Hirshhorn in Washington. Another hugely successful artist and tableware collaboration is of course the Illy Art Collection. In 1992, Francesco Illy had the idea to invite a group of artists to use the iconic Illy expresso cup as ‘muse’. Since then over 100 artists have collaborated in the range, including Anish Kapoor, Louise Bourgeois and William Kentridge. The latter’s metallic cup reflecting images from the saucer below poetically transforms the object and cleverly references Kentridge’s use of projection in his animated works. Much of the range has since sold out and Illy can delight in introducing coffee lovers to artists they may never have discovered otherwise. At ArtFlow we believe that there is still enormous potential for creative collaborations between tableware and artists - it is an incredibly fun way to own work by a famous artist at affordable prices. Also it's guaranteed to start a conversation and - after all - isn’t this the heart of every good meal?